What are your service fees ? Simply add an item to your cart, to get a quote with all our service fees included, instantly! White Rabbit Express applies the following service fees to buying service orders. Our minimum fee is $8. $1.00 Per Item Fee This is charged once for each unique item added to the cart. If you purchase 5 of the same item the per item fee is charged once only. For the Mercari website only the Per Item Fee is $4. $4.00 Per Shop Fee This is charged once for each unique shop you need us to purchase from. 9.9% Service Fee A service fee of 9.9% is added to your item total. These fees do not cover expenses we may incur from stores such as Domestic Shipping or COD/Bank Transfer fees. We allow you to pre-approve an amount to cover these expenses when submitting a request. For many stores these fees will not be applicable and we always charge actual rates that are charged to us by the store. If the above fees do not equal $8 you will instead be charged the minimum service fee of $8. 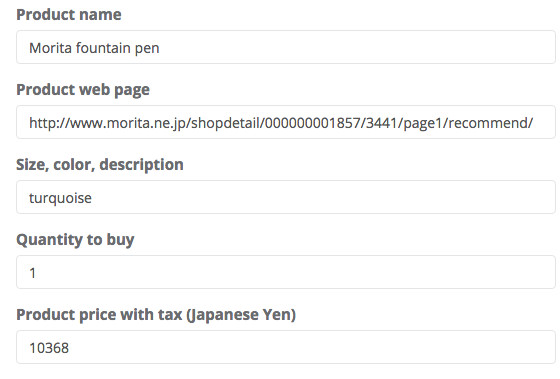 As auctions, Otamart and Fril (Rakuma) must be processed individually we charge the $4 per shop fee for each link in the cart. If you purchase multiple items from the same seller it is still $4 per link. As Mercari is more involved than many other websites and must be processed individually we charge the $4 per shop fee for each link in the cart as well as $8 per item. If you purchase multiple items from the same seller it is still $4 per link for the shop fee and $8 per item for the per item fee. Essentially this means Mercari items are charged $12 per item plus our service fee. You can check the different fees associated with special cases here. For any inquiries or special requests, contact us at help@whiterabbitexpress.com. All of the following is including when you use our buying service. Our shopping assistants are here to help. We consolidate buying service packages at no additional cost. We repack your items for international shipment at no additional cost for most items (We may need to charge for special handling of very large or delicate items). We can handle pre-order and pre-release items. If we can't buy your item, you get a full-refund. How do I use the Buying Service? How does it work? Do you handle preorder items ? What happens if you can’t buy my item ? How long does it take to order my item ? Can you order from a site that only accepts COD/Bank Transfer payment? Can you order an item at a specific date and time ?